I teach an entrepreneurship and financial literacy elective to 8th graders. I have learned that when it comes to the topic of family or personal budgets, simplicity works best. I’ve seen all sorts of budget templates online, most of them unnecessarily complex. 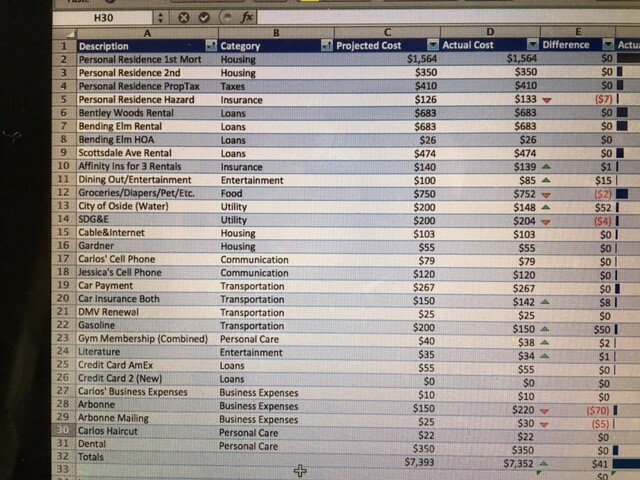 While adding multiple categories can provide layers of detail to a household budget, it can hide or at minimum endorse, certain expenses. I teach them to simplify their expenses budget. For the expense side, you only really need three categories: 1) Fixed costs 2) Variable costs and 3) Non-necessities. When you add categories like, Transportation, Loans, Entertainment, Utilities, Daily Living, Housing, and so on, the budget sheet takes on a life of its own. I get it, personalizing your family budget by adding columns, headings, and colors can be a ton of fun. Not! Sure, you may have been using the same budget template now for a decade and it works for you. As the saying goes, “if it ain’t broke, don’t fix it.” I too had been using the same budget template for several years. As you can see from the picture, I had several categories and the Excel spread sheet allowed me to sort any way I needed. I’ve seen templates with a similar style, a long laundry list of fixed and variable cost items all under an “expense” column. While this may work, it’s not going to help (as much) when it comes to making a push to save more money. After teaching my students using an example, balanced budget from PwC’s Earn Your Future Curriculum, I decided to adopt this style for my family, but not just because it’s simpler. You don’t teach the skill of budgeting for the sake of your students knowing “how” to do it. You teach the skill so that they know “why” they’re doing it. So after the basics, I tell my students that the ultimate goal of a budget is to identify opportunities to cut spending. “Wasting money is stupid,” I say to them. “Plus the more money you save, the more you’ll have available to buy assets.” Yes, they know what assets are by this point. The PwC template makes it easy for me to provide my students with an easy to grasp savings strategy. I ask, “If you were going to cut back your monthly expenses, where would you look to do so first?” This template is so intuitive. Of course the response is, “Non-necessities.” This is why I love this budget style so much. You are forced to differentiate your variable expenses. More importantly, you are showing yourself the map to future potential savings. Budgeting doesn’t have to be a chore. And a budget should be a visual that doesn’t take an accounting degree to make sense of. If an 8th grader can’t take one look at your budget and tell you where to slash, perhaps you’re making it too hard? According to a 2013 Gallup pole, only 1 in 3 Americans prepare a “detailed” household budget. Maybe it’s because Americans dislike being detailed? 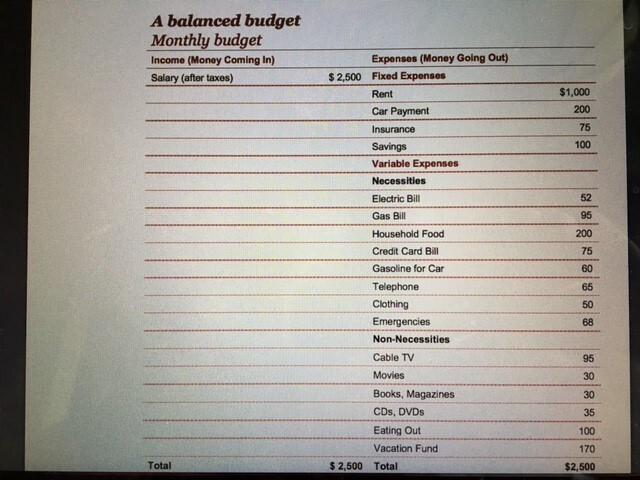 What are your thoughts on household budgeting? Please share your comments below. C. Osvaldo Gomez, a.k.a., “Homie G,” is a teacher, author, entrepreneur, investor, success coach for teens, and personal finance blogger at CommonCoreMoney.com. He’s been featured on Money magazine and the San Diego Union Tribune. You can follow him on his favorite social media platforms, Twitter and Facebook. Always fun to see another way of doing things. I’ve been budgeting for a while, but never added the “category” column at all. I like the idea, especially when you are first laying out the budget. Here’s my OCD take on why I never did it. How do you blend the line items with out the budget getting messy? It’s essential I have food, but not essential that I buy grass fed organic uber clean meats (my better half disagrees). So part of my grocery budget is essential, but part is non-essential (good place to cut). I’ve never had the patience to break up my grocery bill for data entry purposes. Eliminating debt has always been an easy target, but the life style inflation that can creep in to the essential category is just as dangerous! It’s like the “money jar” saving concept of giving, saving, & spending. My wife & I have several budgeting categories but it does come down to some basic reviews when we review our spending through the month. How many bills have we paid so far, how much are we going to spend this month, & are we saving more than we are spending? Thanks for the template, love the simplicity! I am quite eager to try out cos I am one of the people that never able to follow a budget (saving in between 30-50% of my income nevertheless, if that counts). A quick question: I personally think there are things that are in between necessities and non-necessities. How would you separate these? I gave up on budgeting a while ago… My husband works shift work and his hours can drastically vary each week, which made budgeting extra complicated. Although, you have my brain going with this post, trying to think if an approach more like this would work for us. OK, now with that corny stuff out of the way, I think this is awesome. I like the simplicity factor in having the 3 main categories. It’s a perfect way to set it up and you have the sub-categories roll up into those. So, you know what your non-necessities are and you can actively try to chip away at them. I think it’s genius. Plus, what you’re doing with these students is nothing short of remarkable. You are providing them with a skillset that most high schools and colleges don’t even provide. You’re saving them tons of future stress in their 20s and 30s. I pray it sticks with them all. So exciting to see that you’re teaching this. My high school cancelled our personal finance right after I took it, which is extremely unfortunate. My boyfriend and I have both talked about wanting to see schools integrate finance/business communication/entrepreneurship and how to get involved, so we welcome any suggestions you have. I love simplicity. When it comes to money we almost all make things more difficult than they need to be. Finding solutions that 8th graders can understand is a wise strategy for all of us. Interesting! I’m still finessing our budget and it’s becoming super detailed. I liked the simpler breakout. However, I would think it’s easier to do necessities vs non-necessities. For example, stuff like clothing, while variable, can still be considered a non-necessities depending on whether you only shop when you “need” things or if you shop for “fun”. That’s smart. I am a nerd/finance guy and detailed about it, so I know which of my categories are variable without listing them, however, I may reorganize it in the order you propose – for simplicity’s sake.